JuJu is Gioele Valenti, a Sicilian psych rock musician whose previous projects have included Lay Llamas. 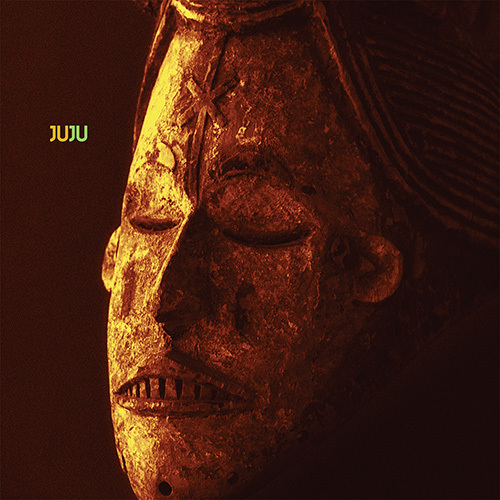 But while this last incarnation of his muse sounded classically cosmic and trippy, JuJu is a different proposition altogether. Rather than mine the exhausted seam of 60/70s pastiche, Valenti has produced a brilliant album of expansive and propulsive dream pop with intensity, locating a sweet spot somewhere between the gothic post-punk of Joy Division and The Cure, and the spiky art-glam of Brix Smith-era Fall and Danielle Dax. Given the name and Valenti’s nationality, this could easily be tagged as another slice of Italian Occult Psych, but there’s something more going on here than just a casual flirtation with the arcane. While JuJu’s music taps directly into the power of rock – its riffs and repetition – as a branch of creative magic, its inspiration, according to Valenti, comes from “the current Mediterranean exodus tragedy, of people and culture lost at sea.” Sensibly, he doesn’t tackle the subject head-on, but takes a more allusive approach, presenting a suite of songs that alternate in mood between uplift and melancholy, determination and doubt. ‘Samael’ aims right for the rock motherlode with a strutting bass and synth line that twists T.Rex’s ‘20th Century Boy’ into a monolithic slab of electro-boogie. In contrast, Valenti’s lightly-accented but heavily-reverbed voice takes its time, carefully delivering an ominous series of non-sequiturs: “Starter. Flashlight. Mother. Mountain.” There’s hints of African percussion, some melodramatic backing “oohs”, and a spooky choir before the chorus finally crashes in. The control of all the elements is superb, producing a song that’s both big and brash, eerie and dark. ‘Stars And Sea’ is another change of mood, a nocturnal desert blues that conjures a scene of refugees gazing at the twinkling lights of a faraway coastline, the smell of campfires and cordite in the air. Valenti’s vocals are artfully smeared but delicate, a guiding spirit in your ear: “Strange men come to your house / Taking over in the middle of the night.” Just as the groove starts to lull you, a crunching metronomic riff kicks in, urging you on to the sea. ‘Dance With The Fish’ is a few piano notes heard as though from underwater. What sounds like a coastguard’s loud hailer calls out in the darkness, but a lovely rising string motif and submarine ping drag you downwards. Repetition is used as dynamic throughout the album, particularly on its final three tracks. The standard response at this point is to start talking about Krautrock – but while Valenti is clearly a fan of Neu!, his arrangements owe more to dance music’s careful adding and subtracting of elements to create nuance and texture. ‘Sunrise Ocean’ is based around a pulsing but slippery guitar line which gradually builds into a fantastic piece of driving psych with just a hint of menace. ‘Lost’ starts as a gorgeously proggy piano ballad before adding a stomping beat for ballast – its rolling mantra of “Where do we go from here now that you’ve lost your soul?” is both hypnotic and disconcerting. Finally, ‘Bring ‘Em War’ closes the album with industrial bass, lurking Hammond organ and an insistent riff like a distress signal. JuJu is an album of sweepingly melodic music that still retains a strange kind of intimacy. Just when you thought you might never want to hear another ‘psych rock’ album again in your life, along comes an artist who resets the co-ordinates and makes the past seem startling new again.